What does ‘summer’ mean to you? A beach and a sun-lounger? An escape from school work? Relaxation? Freedom? In THE TWICE-LIVED SUMMER OF BLUEBELL JONES, Bluebell gets an unexpected birthday present: herself, from one year in the future, full of advice about how to create the perfect sunshiney summer. 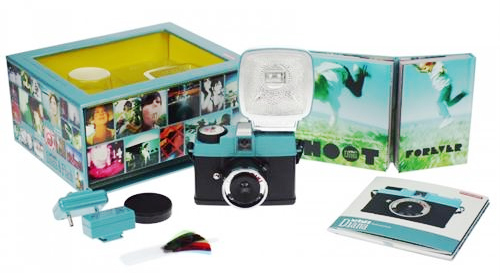 Blue also gets a retro ‘Mini-Diana’ camera for her birthday – and you could win the very same camera! Just send in your best Summer Snap by September 1st – and you’ll be entered into the Summer Snap! prize draw. 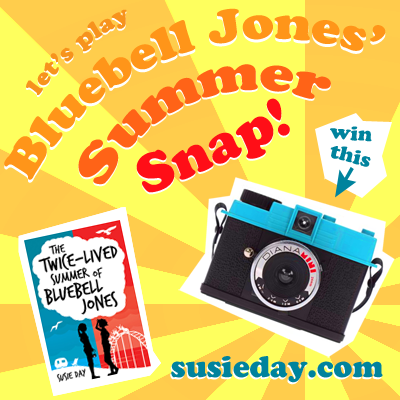 The ‘Mini Diana’ camera in ‘Bluebell Jones’ blue, plus snap-on flash, colour gel filters for coloursplashing your shots, the ‘Shoot Forever’ book, that all important 35mm film – and a signed copy of The Twice-Lived Summer of Bluebell Jones. you must own the photo you send in (ie have taken it yourself or have the permission of the person who owns it): no stealing pretty photos from the internet! Huge thanks to Marion Lloyd Books and Scholastic UK for making this competition possible. Closing date: September 1st 2012. 1. Open to UK and Ireland residents aged 11 and over who enter the competition before the closing date. 2. The prize will consist of x 1 optical systems lomography Diana mini flash camera. 3. The closing date for receipt of entries is 1st September 2012. The decision will take place on 1st September 2012 and the winner will be notified by telephone or email. If contact cannot be made within two weeks of the decision being made, the prize will be forfeited. In this instance, a second draw will take place. The name and county of the winner will be made available on request and receipt of a SAE. The judges’ decision is final and no correspondence will be entered into. 4. No purchase necessary to enter. 5. Only one entry per person. Bulk entries from any source will not be ac­cepted. 6. Entries that are incomplete, illegible or fraudulent will be deemed invalid. No responsibility will be accepted for entries lost, corrupted or delayed in transmission. 7. This competition is not open to employees of Scholastic in the UK or Ireland, associated agents or anyone concerned with this promotion or to members of their immediate family. 8. This offer is not to be used in conjunction with any other offer/promotion. 9. There are no cash alternatives. 10. The prize winner may be requested to take part in a presentation, which may be used for publicity purposes. 11. Regretfully, we cannot be held liable for system failures at the handling house, on the websites or on telephone hotlines. Neither can we be held responsible for the failure to fulfil the obligations of any third party involved in this promotion, or the descriptions provided by any third party for any items/experiences, although we will always endeavour to minimize the effect to the participant of any such failure. 12. Entry into this competition constitutes acceptance of these Terms and Conditions. 13. We reserve the right to (a) award an alternative prize of equal or greater value and (b) in exceptional circumstances to vary, amend or withdraw this competition on reasonable notice. 14. The promoter is Scholastic Ltd, Euston House, 24 Eversholt St, London NW1 1DB.